The promise of the connected smart lock as a category of course is to replace your keys with the smartphone already in your hand or pocket for convenience and security benefits. 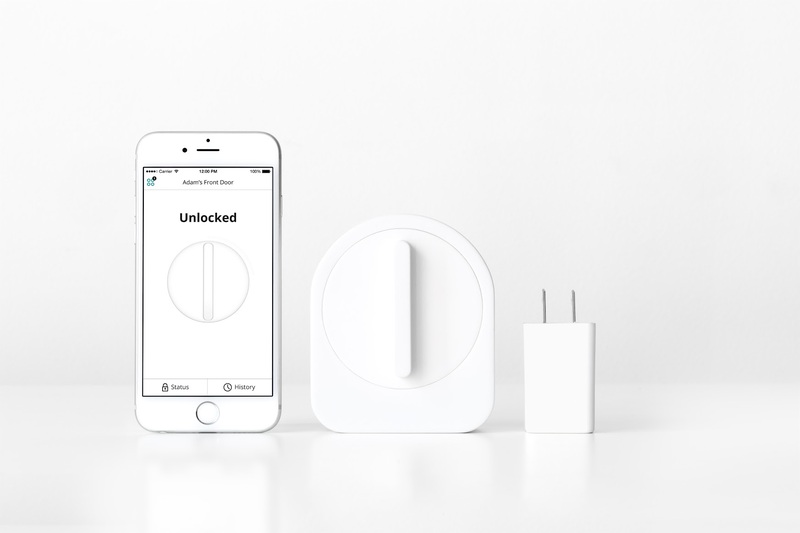 Sesame’s approach combines an iPhone app with a battery powered device that “installs in seconds” and connects with Bluetooth LE 4.0 connectivity. An optional WiFi Access Point accessory adds Internet connectivity allowing you to remotely lock and unlock your door remotely. This version will retail for $50 more at $149 with a $139 early bird price. The actual Sesame device measures in at 3.36″ wide and 2.21″ tall weighing 6.64 oz and resembling a classic kitchen timer in various colors including piano black, leather white, metallic silver, champagne pink, and a two-toned light wooden with a beige center. Powered by two CR123A’s, the Sesame claims 500 days of use before replacing the batteries. The exterior features a universal latch to manually lock and unlock the deadbolt while the inside features an accelerometer for detecting unique knock patterns. The iPhone app allows users to share access to guests while logging access and offering notifications for unlocks and locks. Unlock methods include voice activation through the iPhone app, knocking on either your phone or the door with a unique pattern, or the old fashioned method using your key. Sesame can also automatically lock when you close the door. If you’re interested in the smart lock space but don’t want to commit with a high price tag and new hardware, the Sesame lock’s $89 entry price and compatibility with existing deadbolt locks should be highly appealing for iPhone users. An initial crowdfunding campaign through Kickstarter begins today and will run through late April with the first 100 units shipping next month and an additional 7000 units shipping by the end of May. Until then, check out the clever Adam Lisagor “Sandwich” video above explaining showing Sesame in action.